The game of the bridge (Il Gioco del Ponte) is a historic event, which takes place annually on the last Sunday of the month of June in Pisa. 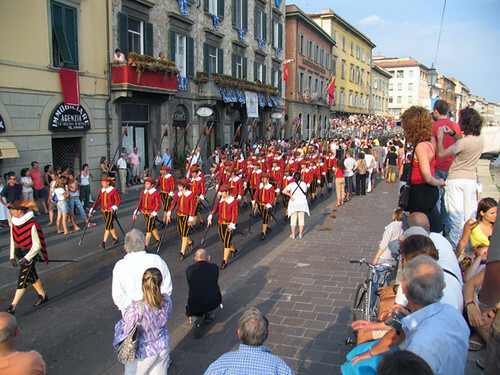 The highlight is a historic parade along the Arno promenade, with more than 700 participants . After the historic parade the two opposing teams “Tramontana” and “Mezzogiorno” meet to a power struggle at the Ponte di Mezzo. In the middle of the bridge there is a 12 meter long car on rails. Every team gathers at the two ends of the car. From here, the men try to push the car on the opposing side the more than possible. The victory goes to the team, which has managed to place the car on the opponent’s territory. Holidays in the hilly landscape of the Valdera, in the province of Pisa.